Lake Lansing North is an amazing park because of the extensive wetlands scattered through it and the Green Trail is by far the most interesting way to explore. 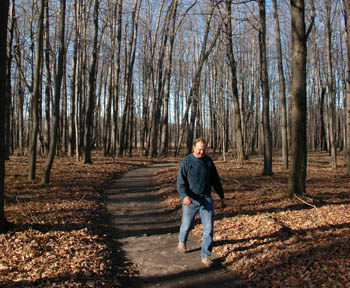 It is a 3.3-mile loop that includes the longest boardwalks in the park and most of the interpretive plaques that were funded by the Michigan Non-Game Wildlife Fund. Entitled "Habitat: A Place Called Home," the plaques examine the various habitats you pass through, who is living where and why “Wetlands Are Not Wastelands.” Good stuff to pass onto your children. The Yellow Cut-off spur shortens the loop to a 2.4-mile hike while still allowing you to explore the largest patches of wetlands. But overall the Green Trail is such an easy – there’s almost no elevation gain – and interesting hike it seems a shame not to experience the entire loop. The main trailhead for the park is near Sandhill Shelter, a picnic area that includes restrooms, a playground and a softball field on the north side of the parking lot. From the east end of the parking lot a short trail leads to the large trailhead display featuring a map and mileage. It also marks the junction with the Red Trail, a 1-mile loop that stays almost entirely in the developed area of the park. From the trailhead the trail immediately descends to the first stretch of wetlands of the day and crosses it on a boardwalk that features a bench in the middle of it. At the other end you return to the forest and climb a low ridge to an observation deck perched on the edge of it with an interpretive plaque nearby. The deck allows you to view a pond in the middle of a sea of cattails and if it’s near dusk there could be a whitetail or two nearby. Within a 0.3 mile from the trailhead you arrive at your third boardwalk and wetland as well as another interpretive plaque. But this one is not on the trail rather in the marsh, surrounded by cattails. Another low rise follows and here the trail swings south and at Mile 0.9 arrives at the posted junction with the Yellow Cut-off. Just beyond it is another boardwalk and the Mile 1 marker. At Mile 1.2 you pass a covered picnic table that was an Eagle Scout project and then in a quarter mile breakout in a utility line corridor. 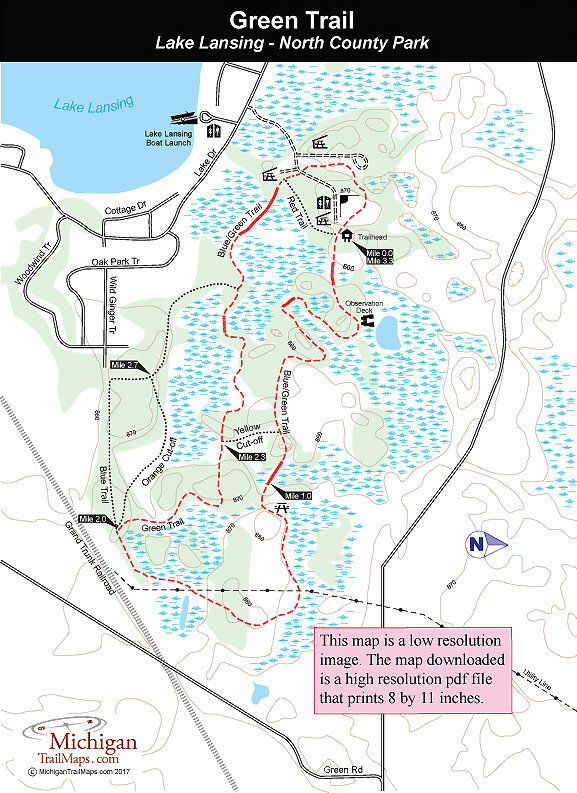 The trail passes underneath it, loops through a pine forest and then passes underneath the utility line again at Mile 1.7 in the most unappealing segment of the loop. You’re now heading back towards the developed entrance of the park. Just before the post marking Mile 2, is the junction where the Green Trail splits north from the Blue Trail. You begin skirting a large marsh and then pass through an impressive stand of spruce, pines so large and old they form an almost impenetrable canopy against the sky. There is little sunlight in this grove and thus little undergrowth on the forest floor, which make the dark trunks stand out even more. You emerge from the spruce at an old two-track that the trail follows west to arrive at the second junction with the Yellow Cut-off, at Mile 2.3. The trail continues west, winds along the edge of hardwoods while skirting yet another marsh. Eventually a boardwalk leads you across the marsh and to the junction with the return of Blue Trail. 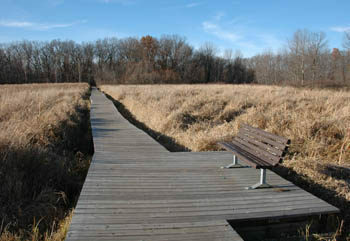 The most impressive stretch is just ahead, the longest boardwalk in the park across its largest marsh. Cattails are all around you and if you’re not in a hurry there’s a bench where you can sit and ponder this amazing scene. At the other end of the wooden walkway you arrive at Oak Knoll Shelter and a picnic area. At this point the Green/Blue Trails cross the entrance road and swing through the developed portions of the park, passing the volleyball court and skirting the softball field before returning to the trailhead. A far more interesting and shorter route is to follow the Red Trail here which skirts the wetland you just cross before ending at the trailhead. Or you can simply follow the park road back to you vehicle at Sandhill Shelter.